Any regular reader of this blog knows that we tend to take ourselves pretty seriously. I mean, we’re serious consultants with serious work to do and serious policy areas to ponder! We’re passionate about the issues of the day that will affect our work, our clients, and life in general out there in the wild blue yonder; whether it be how the German elections could impact the direction of energy policy, or how the twittersphere is chiming in on Europe. We’re also passionate about cake. Yes, you read that correctly, cake: the edible foodstuff that is sweet and moist and can be blamed for ever-expanding waistlines of office workers, worldwide. 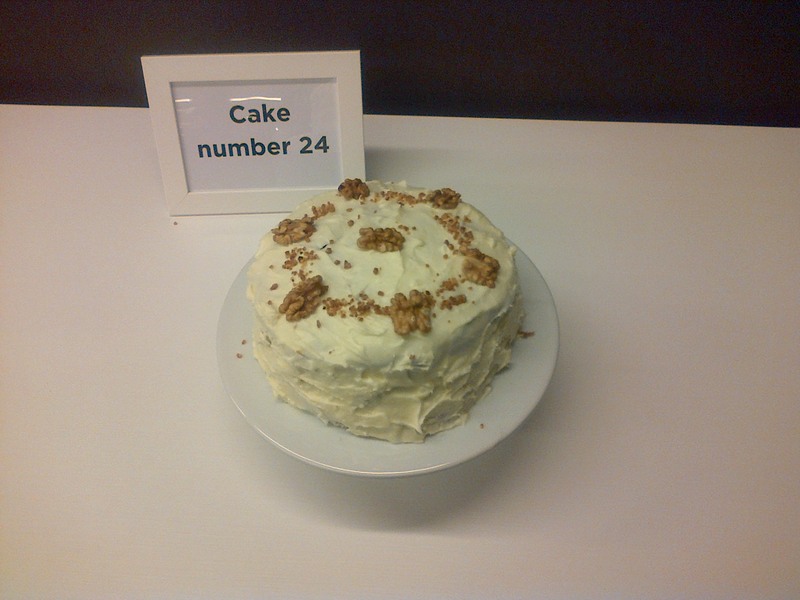 Now it seems, as the resident baking enthusiast here at FleishmanHillard (and instigator of semi-regular, now infamous ‘cake competitions’), I’ve begun to get a bit of a reputation. 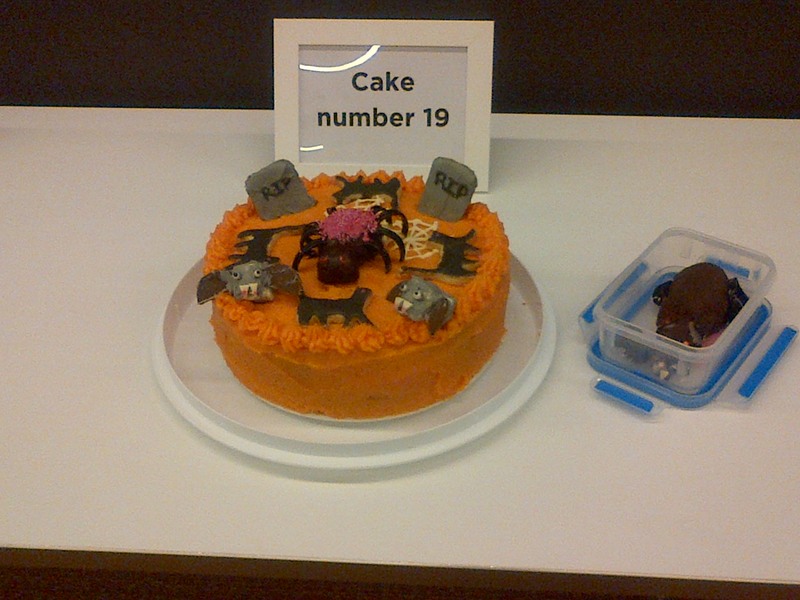 So when colleagues spotted an opportunity to form a team to participate in the BritCham Great Brussels Charity Bake Off competition, they knew exactly who to call. We pulled together a team of bakers (me, Jane, Sandrine, & Maria Chiara), gave ourselves a name “FHun in the Oven” (apparently makes Brits chuckle – thanks James), and decided to bake a good ol’ fashioned Hummingbird Cake – a specialty of this famous London bakery (Like a carrot cake, but not. See the recipe below). …Until we started checking out the twitter feed #BxlBakeOff and saw the seriousness with which our competitors clearly take themselves. There were orange=frosted covered Halloween cakes that tasted like my childhood and were adorned with creepy little edible marzipan bats and rats! 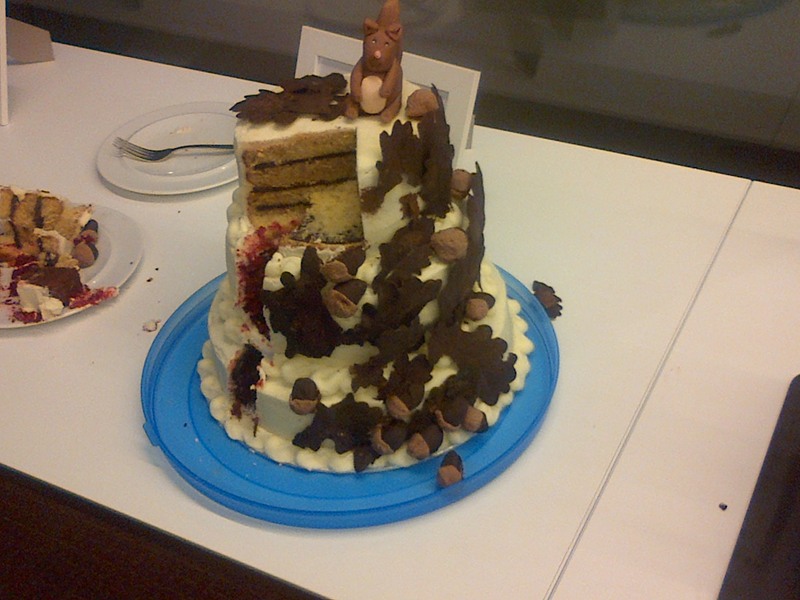 There was even a cake depicting an EU legislative timeline! I mean, these people really do EAT, breathe and sleep their work! Needless to say, our humble little hummingbird cake, despite its deliciousness, found itself a little out of its league amongst the worthy competitors. Ok, so we didn’t win this time. And we’re not sore losers. (No really, we’re not!) But now that we know what we’re up against, well let’s just say: challenge accepted! Roll on November, where ‘pie’ features as the next competition category….and watch this space for further tales of our competitive baking adventures! Put sugar, eggs, oil, banana and cinnamon in a freestanding electric mixer with a paddle attachment (or use a handheld electric whisk) and beat until all the ingredients are well incorporated (don’t worry if the mixture looks lightly split.) Slowly add the flour, bicarb soda, salt and vanilla extract and continue to beat until everything is well mixed. In a separate bowl, beat icing sugar & bitter together in a freestanding electric mixer with paddle attachment (or use a handheld electric whisk) on a medium slow speed until the mixture comes together and is wel mixed. Add the cream cheese in one go and beat until it is completely incorporated. Turn the mixer up to medium-high speed. Continue beating until the frosting is light and fluffy, at least 5 minutes. Do not overbeat, as it can quickly become runny. When the cakes are cold, put one on a cake stand and spread about one quarter of the cream cheese frosting over it with a palette knife. Place a second cake on top and spread another quarter of the frosting over it. Top with the last cake and spread the remaining frosting over the top and sides. Finish with pecan nuts and a light sprinkling of cinnamon. Fleishman-Hillard Brussels was particularly enthusiastic to welcome Li Hong, President of Fleishman-Hillard China, as he visited the capital of Europe last week. While almost 8000 kilometres separate Brussels from Beijing, the upcoming leadership transition in China is poised to have a dramatic impact on the economy here in Europe, as in the rest of the world. His visit was thus the perfect occasion to discuss, with a handful of EU public affairs professionals from a broad range of industry sectors, the challenges the country is facing and the outlook for various industry sectors moving forward. Trade policy is an exclusive power of the EU which means that it is the EU, and not individual member states, that legislates on trade matters and concludes international trade agreements, covering services, intellectual property and foreign direct investment. With the globalisation of the supply chain, China has become a major, if not the most important, production hub for multinational companies operating in Europe. Any shift in labour or environmental legislation taking place in China has an impact on foreign companies producing in China. Similarly, China is looking at the EU as a landmark for matters like the classification of chemicals substances or product safety legislation. The fruitful discussions further confirmed the global dimension of EU public affairs. As influence operates from multiple pressure points and sources across different time zones, a silo approach to public affairs is no longer viable. Companies navigate in a globalised system with global challenges (trade, environment, food security, energy scarcity): what happens in China impacts the EU and vice versa. In view of the current global economic slowdown, all eyes are expectantly turned on market prospects in China where a burgeoning economy and growing middle class still offer untapped opportunities for foreign players, from the pharmaceutical and retail sectors to logistics, automotives and chemicals. On November 8th at the 18th Party Congress, the Chinese Communist Party (CCP) will see new faces in many of the top leadership posts. Given the importance of the Party’s leadership to the functioning of the world’s second-biggest economy, these major generational changes will strongly impact the margin of maneuver of foreign companies operating in China. It will also have a critical influence on the future of EU-China political and trade relations and therefore on public affairs in Brussels, Beijing and beyond. Stay tuned for a comprehensive analysis of what the upcoming Chinese leadership change can bring to the industry, European consumers and EU policy makers. Exactly a year ago today, I arrived in Brussels, apprehensive, hesitant but most of all excited about beginning an internship for one of the world’s largest communications agencies. It is true to say that in the early days I had officially landed in hot water; new job, new country and ridiculously high heels on the infamous Brussels’ cobble stones, my first few days at Fleishman-Hillard are probably better described as a balancing act. However, things very quickly began to fall into place and after an eventful and adrenaline-filled twelve months, (an office party on a boat, a moment or two stuck in an elevator and an office ‘fire’ included) I can hardly believe that my first episode in Brussels and my year at Fleishman must draw to a close. It has been an unforgettable year and an incomparable experience that I would recommend to anyone seeking professional experience in the public affairs sphere. There are too many things to write in a blog post about exactly why I have enjoyed my time here so much so I have decided to dedicate this blog to the top 3. Being an important part of the team. An internship at Fleishman does not fall into society’s stereotypical view of an undergraduate intern. Believe me when I say that your tasks will not involve making coffees for your senior colleagues or spending days attached to the photocopier. Although there may well be times when you become better acquainted with the coffee machine than anyone either inside or outside of the office. From very early days you are trusted with client work, invited to brain storms and relied upon. Working as an intern for Fleishman is unlike any internship I’ve ever heard people speak of, you are an important part of the team and your contributions are valid. This really provides an opportunity to get more involved with your clients, develop a passion for their issues and make an impression on your colleagues. Working for Fleishman gives you a real sense of achievement. I have been fortunate enough to receive the support and encouragement of some of the most inspirational people I have ever met. It is thanks to this support that I have striven to continually make the most out of this opportunity in every way possible. I have been proud to work for Fleishman-Hillard and I am proud of the things that I have accomplished. From making the Christmas party 2011 at least a 4-month mission, to becoming perhaps a little too obsessed with the issue of women on corporate boards, to jointly presenting a ‘How to’ session, I am walking away from this year with a new wave of confidence. Perhaps the most fantastic thing of all this year is just how great the people at Fleishman are. I never imagined that the people here would not only be so talented and scarily good at what they do, but that they would also hold some of the greatest personalities that I have known. The atmosphere in this office is unparalleled! My year at Fleishman has been so much more than just an internship, it has become a way of life that I have become incredibly fond of and dedicated to. I will never forget the kindness, humour and support of all of the people in this office. I still looked forward to coming into work this morning, excited at the thought of facing a few final challenges and grasping the opportunity to spend a final few hours working on issues that I have become so deeply passionate about. I have enjoyed spending one more day working with colleagues who are inspirational on so many different levels; their expertise, knowledge, enthusiasm and constant desire to achieve the very best. I am fully aware that I am incredibly lucky to have spent a year surrounded by people of this calibre, who have always been so willing to dedicate their time and to share their knowledge with me. There are few people who at twenty-one can say that they have been this fortunate and I am grateful to Fleishman for giving me such a wonderful opportunity. To all of those who I have had the pleasure of working with, I hope you will recover from the exhaustion of dealing with a years worth of never-ending energy. However, most of all, I would like to thank you for your inspiration, your kindness and your time. I could not have had a more valuable, or more enjoyable year and I am going to miss you all a lot. At last the sun is shining, after months of rain. London gears up for the Olympics and is thronged with visitors. Brussels is quiet, Paris is empty. The roads to the south are crowded. The mountains and the beaches beckon. It must be the summer holidays. But not for those politicians and officials across Europe struggling with the latest phase of the eurozone crisis, nor for all those individuals whose lives have been turned upside down by the economic downturn and cuts in public spending. Back in autumn 2007, when I posted the first of this regular series of blogs on European affairs, nobody could have anticipated the scale of the economic crisis which was to hit Europe, nor conceive of the threat which this would pose for the future of the monetary union and indeed for the European Union as a whole. These have been transformative years. Five years ago the main preoccupation for the EU was approval of the Lisbon Treaty, still to be ratified by several countries and then blocked by the “no” vote in Ireland in 2008. The euro was riding high on world markets and the level of indebtedness of governments, banks and individuals was ignored. Then in the autumn of 2008 came the credit crunch. Most people were unaware how close the world came to a global banking collapse. It was only drastic action by central banks and governments which stabilised the situation. There have been many victims since then. Almost every country has changed government and changed leader (Germany’s Merkel a notable exception). Coalitions have taken over from single party administrations. Politicians have been forced to take tough decisions, promising little other than hard times ahead, and although they have been punished at the ballot box their successors have been obliged to sustain a policy of austerity. Ordinary individuals and families have been taking the biggest hit, whether through unemployment or cutbacks in social benefits and other government spending. The “European social model” will never be the same again. The crisis showed that it depended upon state borrowing and the loading of debt on future generations to fund current spending. Indeed, it’s worth remembering that the Commission took the Council of Ministers to the European Court in 2004 because of the refusal of France and Germany to respect the limits on debt and spending in the Stability and Growth Pact – limits which had originally been put in place on German insistence because of fear that Italy would spend beyond its means! Of course the emphasis now is on economic growth, but the challenge is to stimulate research and innovation, to encourage training and apprenticeship – all measures which call for public expenditure – and it is the weaker economies such as Spain where the need for such measures is most compelling, to build a dynamic economy for the future. It’s said that European integration surges ahead in response to crises. The eurozone will only survive if it has all the attributes of a monetary union, including economic and fiscal policy-making at an EU level and the means to ensure that the rules are respected. For those countries outside the euro, and especially the UK, this development will pose a major problem – how to influence policy developments while keeping a distance from the institutional process. As my series of blogs comes to an end I see that US Republican candidate Mitt Romney, who is attending the opening ceremony of the Olympics, has rather a sour view of alternative ways ahead, of which “one leads to Europe. The other leads to the kind of dynamism and prosperity which has always characterised America.” It would be interesting to see Romney’s remedy for the US budget deficit. In any event the crisis is forcing Europe to put its economy on a sound footing and rebuild its dynamism and prosperity. The process may well take another five years – or perhaps more. Some would call it a life sentence. Others would call it a vocation. Many would argue I need more than an annual summer vacation. It’s been 10 years this August since I left the European Parliament (and working for someone I miss on a daily basis) and joined Fleishman-Hillard. Here are ten reasons why I’ve been here ten years. I have a personal stake in the EU. I was indoctrinated at the College of Europe (I’m one half of a College couple). I still get hacked off when people talk down about the European Parliament. I’m happy to admit to being a ‘believer’ in ‘the project’ of EU integration. I may not work in the EU institutions, but my chosen career allows me to participate in EU integration every day of my working life. There are few that can claim their personal interests coincide with their day job so happily. The great thing about consultancy is you get to help folks from the real world understand the EU and vice versa. There’s something intrinsically fascinating about understanding different sectors and being able to translate EU jargon and arcane processes into something that means something to someone. One of the most fascinating parts of our job is getting to go up air traffic control towers, visit chemicals plants and tour breweries as part of getting to know our clients businesses. Without gaining that understanding, we’d be pretty poor consultants. Explaining the EU to business and business to the EU helps democracy and makes for better policy at the end of the process. Over the last ten years I’ve lost count of the number of EU citizens I’ve had to teach crash courses on the EU, its benefits and how it works. Equally, much of our work involves ensuring that our client’s insights about their businesses and what’s affecting them are translated for policymakers and presented to them in a way that’s understandable. It strikes me that we’d have pretty rubbish policy if stakeholders didn’t have a voice in the debate. And they’d be a lot less informed EU citizens out there if we weren’t around too. My job has changed immeasurably over the last ten years. From the issues I’ve covered to the sectors I’ve worked for and the tasks I undertake, every day is different. From following issues to managing clients, to managing people and now helping run a business, it’s been a journey. The great thing about this consultancy is your role can evolve over time, while still doing the things you love (generally all listed above). I like to think that I can think with the best of them, but to be honest I still wish to get my hands dirty. Whether it’s drafting a position paper, media release or getting out there to events and speaking to folks, I like the doing as much as the thinking. Generally our job is a mixture of both. All communications is about change, either in behaviour or perception. It’s great to be able to measure the success of what you do, not by counting outputs but by measuring a change in a behaviour or perception of those we’re seeking to reach. Someone once said to me that (EU) Brussels is the least commercial town on the planet. That may be true, but in a town of policy wonks (something I’d class myself as) consultancy is probably the most commercial thing going. Once again there’s a measurable outcome in there. Intelligent, committed (or need to be), experienced, interested, passionate… I could go on. From my boss to the latest account executive to wow me with their knowledge, as we don’t produce crisps or indeed anything else it’s the people that are the firm. I’ve been fortunate to count some of the best amongst those I’ve worked with. Many have become and stayed friends, even after they’ve moved on. It’s always great to see Alumni at events – funny how often they speak as if they’ve come home. As I note that the average lifespan of a management team member here is well over 10 years I conclude that we must be doing something right. It’s hard work but at the same time I’d have to say I laugh out loud at least once a working day. Ten years of doing so probably says I enjoy coming in every morning. Increasingly our work looks at issues from a European (national capital) and even international perspective. It’s great to be able to have conversations with trusted colleagues about how the issues are playing out in London, Berlin, Beijing and Washington. It reminds you that much of what we do here is affected by and affects others parts of the world. It takes you out of that comfortable Brussels bubble which we can sometimes inhabit. If you too fancy a life sentence, applications can be made here. Banking Union: magic solution to eurozone crisis? It seems that a European Banking Union has become the magic solution to the eurozone debt crisis. This week’s meeting of eurozone finance ministers in Brussels confirmed that European funds will provide direct support to Spanish banks, to the tune of €100bn in loans from the European Financial Stability Facility and subsequently the European Stability Mechanism. The aim of the scheme is “to break the vicious circle between banks and sovereigns”, which implies that eurozone governments will no longer be expected to shoulder the burden of bailing out their banks in times of trouble. The debt will not be part of Spain’s government deficit, as no guarantee will be required of Spain, but in return the government will bring in tougher austerity measures, in order to cut borrowing below 3 per cent of GDP by 2014, a one year extension to the current deadline. The plan is bound to raise a further storm in Germany, where many commentators see it as transferring risk to German taxpayers which should be borne by the shareholders of the banks concerned and their governments. Another challenge for Mrs Merkel! The first tranche of €30bn will be transferred by the end of July and held by the Spanish government as a contingency. Madrid is committed to wholesale reform of the Spanish banking sector as a whole and major institutions will be “stress-tested” to establish their viability. Next stage will be the creation of a “single supervisory mechanism” for the banking sector which, once established, would oversee the reform and restructuring of banks. This should be in place by the end of the year, provided that Commission proposals, due in September, can be adopted in time. Commissioner Michel Barnier has identified the questions this raises in his statement to the Economic and Monetary Affairs Committee of the European Parliament, and he still has a lot to answer. He asks whether the supervisor would replace national authorities or complement them; how the authority can “be open” to all member countries and respect the integrity of the single market; and whether it will oversee all banks, or just international institutions and banks in difficulty. Altogether a list of big questions, and of major significance for the City of London. There is no doubt that the scandal over the alleged fixing of LIBOR and EURIBOR rates by 20 or more global banks will further strengthen the argument for tougher EU regulation just as Europe is planning for a banking union with common rules. Barnier has lost no time in pressing for legislation which would require false reporting of Libor rates to be made a criminal offence and introduce measures to ensure oversight of the reporting system. For years the prospect of regulation was fiercely resisted across all financial services at both the national and the European level, and still some pockets of self regulation remain, including the fixing of LIBOR rates, which provide the benchmark for a vast range of financial transactions. How times have changed, when we see the deputy governor of the Bank of England, Paul Tucker, describe the whole scandal as a “cesspit” and tells MPs that “self-certified markets are open to abuse”. It’s not an easy time to be a banker.